I have never done a collab before so when Anna from A Sparkle of Grace reached out to me I was eager to give it a try! Anna is one of my favorite bloggers, I read everything she posts even if it isn't about makeup. We decided to create a tag together all about natural beauty and maintaining healthy skin and hair. We also thought it would be fun to answer the tag questions on each other's blogs. Anna's answers are below and mine are over on her blog, so definitely check them out and let us know what you think! What do you love most about your skin? I actually really like that I'm naturally pale, which is good because I am completely tan resistant. What is you biggest skin concern? Spots! I wouldn't go so far as to say I have acne but maybe. I really had no problems with my skin until last summer, I was always the one with the good skin. Do you tend to use skincare/haircare products from one brand or do you switch them up? I definitely switch it up, I'm not even a little loyal with my skincare products. 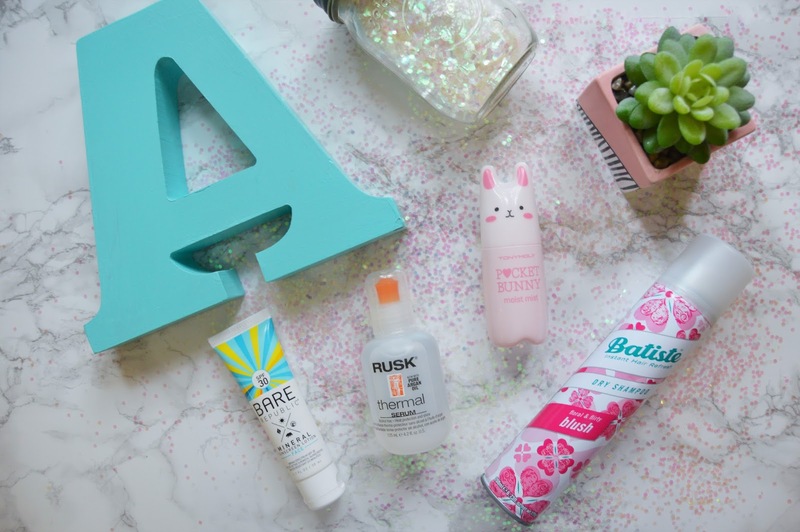 With haircare products, I tend to stick with RenPure, Rusk, and Batiste. How does your skincare routine change throughout the seasons? There isn't a big difference throughout the seasons. In the winter I tend to be more faithful with my exfoliating routine and use more intense moisturizers. In the summer everything is SPF and more carefree. At what age did you start or will you start using anti-aging products? I started it a little after I turned eighteen, and I have been using a night cream and eye cream that are both anti-aging. I have always thought it was better to prevent aging instead of trying to turn back the clock on my skin. What do you do to rescue your skin when it feels tired and gross? Face masks have saved my sanity on many occasions. I usually go for something refreshing like The Creme Shop's Green Tea sheet mask. I also love the Dirty Works Pore-Fect Face Scrub for waking up my skin when it feels tired. Like I said I'm not very loyal to skincare products. Pore-Fect scrub I mentioned in the last question is one of my favorites and I have repurchased it many times. Do you think that organic or all-natural ingredients truly make a difference in skincare or haircare? Honestly, I haven't noticed a huge difference in how the products work, but I always feel better about using products that I don't have all sorts of chemicals in them. That is one of the reasons I like handmade skincare so much. My hair is a dark blonde and it's fairly thick and slightly wavy, I'm also starting to get a few little gray hairs coming in. Do you like to wear your hair naturally or do you usually style it? I wear it naturally, for the most part, I only curl and blow dry it on the weekends. My hair gets damaged really easily so I try not to use heat on not it more than a couple times a week, and of course using heat protection is a big help. I have also started washing my hair less often and I have been managing to make it three days without a shampoo. I try to do a 20+ minute coconut mask on it before each washing, and I get a trim every eight weeks. Do you feel like there is a misconception about beauty bloggers being dependent on makeup? I feel like people do tend to think beauty blogging are a bit vain and a little shallow, but it's like every other stereotype, it may be true for some but it's definitely not for others. I think sometimes people don't look beyond the blog and think"well all she ever does is write about makeup" and I'm over here like yeah, of course, that's why it's a beauty blog. I don't blog about my family, my problems, and my everyday life because it's personal. As far as being dependent on makeup, I feel like it's different for all of us. For me, it's a hobby that I find relaxing and fun, but for other, it's a living. So, the moral of the story is don't but everybody in the same box. Don't forget to read my answers over on A Sparkle of Grace and let us both know what you think of Anna's answers! I for one can't believe she gets a trim every eight weeks, I haven't gotten a haircut in over two years (yikes). I hope you enjoyed the tag and my first collab! If you would like to answer these questions as well, consider yourself tagged. 9 comments on "The Natural Beauty Tag (Collab With a Sparkle of Grace!)" Hahaha it does seem like a lot, but I get really bad split ends and I hadn't been taking very good care of my hair until recently. It was fun working together on this tag. This is a lovely tag and a great collab, I will read Anna's post next!! Great tag ! Very interesting to read ! Really enjoyed reading this tag! Beautiful girl, do you want in a magnificent occasion glorious bloom you do? Here dress infant wedding dresses is customized for each aspect are excellent, the dress is very elegant and beautiful, http://www.clavonna.com you meet do not miss it.